2017 Honda Ridgeline Begs the Question: Why Settle for Worse? The world is flat. Global warming is a myth. Trucks are supposed to drive like trucks. 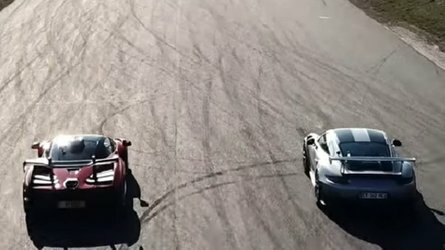 There's a whole segment of 'enthusiast truck owners' that are severely out touch. Because if it looks like a truck, and does truck things, it must drive like a truck, right? The 2017 Honda Ridgeline takes that antiquated thinking and turns it on its head, making a believer out of any mid-size truck owner—or anyone that enjoys confidence while driving, frankly. 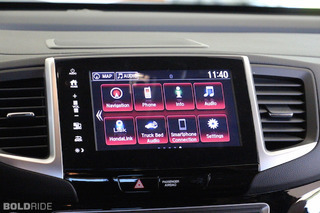 Being a company that continually looks to the future, Honda applied some of its patented forward thinking towards its latest vehicle. For reference: the Civic is the best-selling car among millennials, meaning that it ticks all the right boxes in the mid-size segment for young buyers. Other just don't. 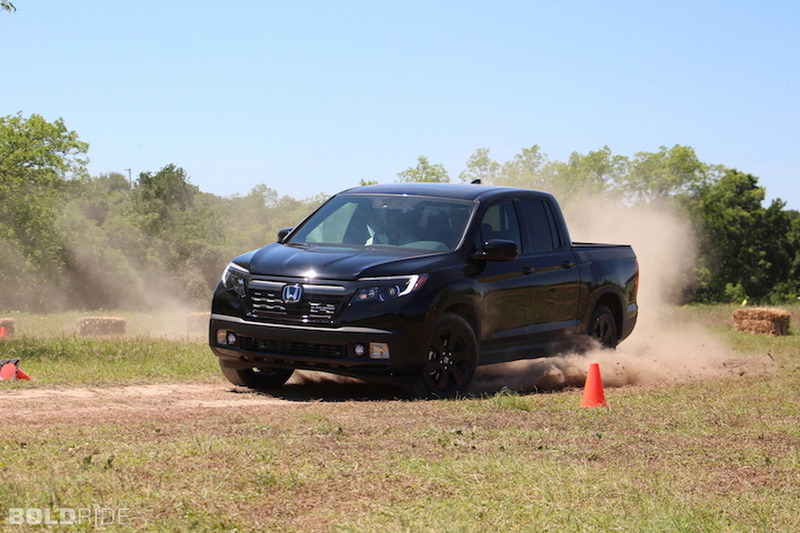 Engineers and execs alike have the same hopes for their new Ridgeline. 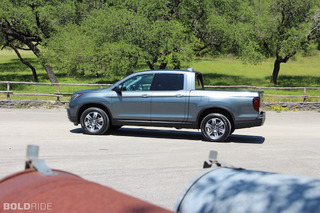 The base for the new Ridgeline is the new Pilot, essentially. 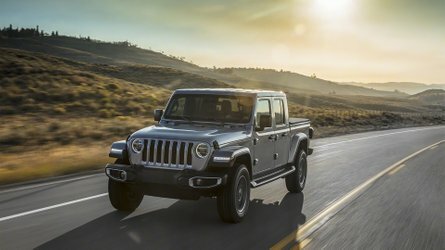 It shares 50 percent of the same components with the three-row SUV, or as PR people like to put it, it's 50 percent unique from the three-row SUV. That 50 percent mostly sits at the back. A revised suspension helps it do truck things, but the design remains very SUV-esque. If you put the fascia and cabin of the Ridgeline and Pilot side by side, you probably wouldn't be able to spot the differences. 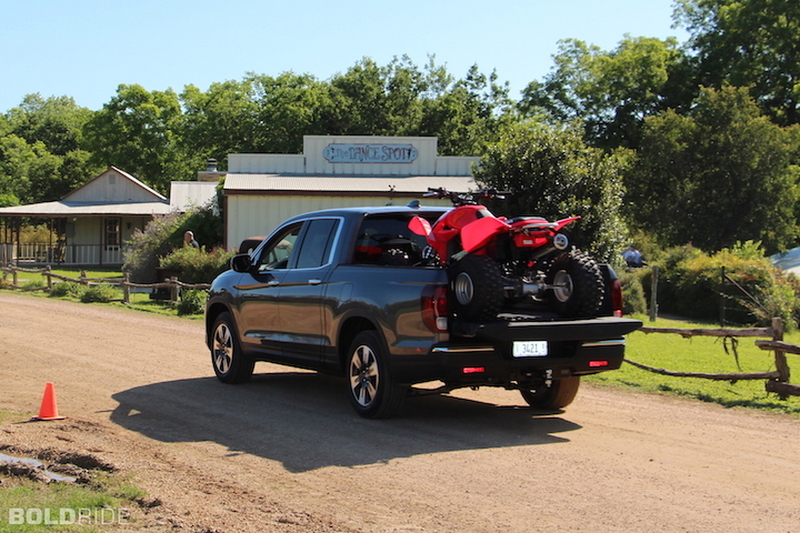 The only thing that separates the Ridgeline from the Pilot, at least visually, is the bed. The widest bed in the segment, in case you need to put wide things in it, like two dirt bikes or a bunch of bodies. It's a durable bed too. Honda dropped a bunch of river rocks into it, told us to scratch it with a garden tool—really, do whatever we physically could to "damage" the bed. I couldn't. It scratches, sure, but initially seems to stand up to wear and tear exceptionally well. Only time will tell if that's completely true. The bed is the biggest selling point here. It's wonderful, it's inventive, it's the best bed in the segment, bar none. 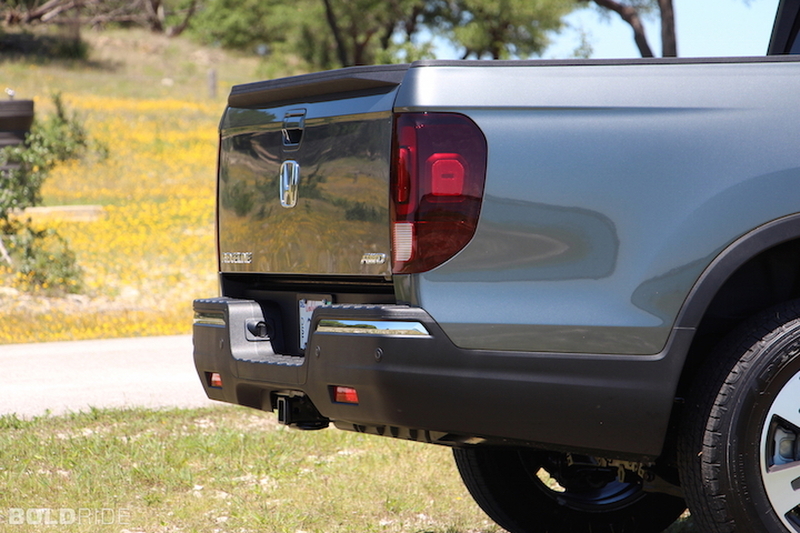 It may seem like such a trivial aspect of the Ridgeline to some, but it really is what separates this truck. If you watched the Ridgeline Super Bowl commercial, the singing sheep would tell you that the in-bed audio system is creative, the 110 volt plug is thoughtful, and the extra storage is extremely useful. Not to mention the dual opening tailgate, a Ridgeline exclusive. 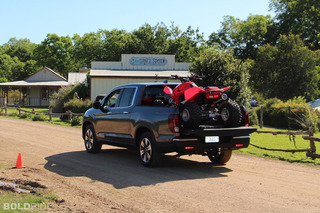 The Ridgeline was made for the young, active person/family. Tailgates, picnics, camping; it actually does have a camping extension for the bed that looks superbly cool. Inside the cabin is comfortable. As mentioned earlier, essentially a Pilot minus the third row. There's plenty of space in the backseat, Apple CarPlay and Android Auto compatibility up front, and a healthy amount of cup holders. Find me a car with 30 cup holders and you've found me the perfect car. But the biggest question of all, given my...ehem...blunt opinion: how does it drive? It drives well, but nothing like you'd expect in a pickup truck. 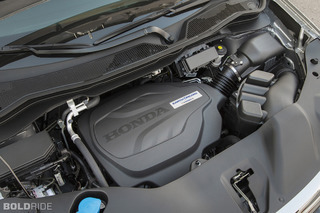 Think of it as a CR-V with a bed, because that was the goal for Honda from the beginning. You can thank the unibody unit-body construction for that, which does away with the antiquated body-on-frame setup for something much more refined. 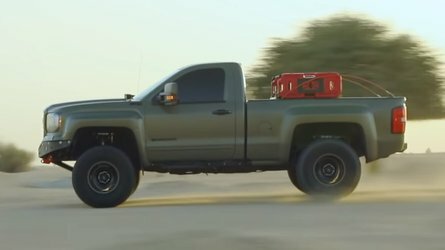 That's not to say it doesn't do 'truck things' Dirt roads, hills, deep sand pits—the Ridgeline performs well-above what anyone truly needs in a truck. It has the towing capacity of up to 1,584 5,000 pounds (edit: max payload of 1,584 pounds), or something like a small bass boat, or trailer, or side by side and ATV. Anything bigger than that and it's worth getting a full-size anyways, not a mid-size competitor. It's fun enough, capable enough, rugged enough. 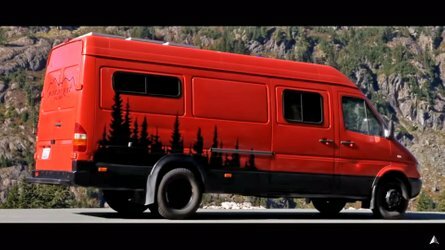 It's a new generation of truck for a new generation of buyer. 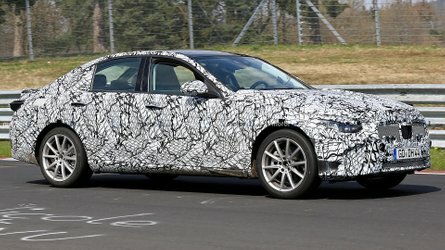 And while competitors still stick to what's worked in the past, Honda is looking towards the future. The cheapest Ridgeline you can get starts at $26,495 $29,475 (edit: Honda incorrectly informed us that pricing started at $26,495; actual pricing is $29,475) which only has two-wheel drive and lacks some features. Opt for the four-wheel drive version (which you should), and you can snag one of those for $31,275. The range tops out at $42,870 for the all-wheel drive Black Edition. MPG sits at a very respectable 19/26/22 for two-wheel drive, and 18/25/21 for all-wheel drive. Not bad for a 280-horsepower six-banger. Gallery: 2017 Honda Ridgeline Begs the Question: Why Settle for Worse?